I clenched and unclenched my hands to stop them from shaking. It was all I could do to keep my voice even. I could feel my nails digging into my palm. “Try to think about it logically, Leena,” Mariella suggested. Her usually musical voice was grating. My temper flared and snapped, but I reeled it in. Why couldn’t she understand? Technically, now that the Vengeance had a sustainable power source and the cloaking device was working, the Xathi couldn’t see it. Nevertheless, I wouldn’t call that safe because we still knew next to nothing about the aliens we’d been living alongside. “I’m alive because Tu’ver brought me here,” Mariella said. I scoffed. “Who knows why he really brought you here? He could have intended to use you as a hostage…or a concubine,” I sneered. I had to believe that Mariella was being willfully ignorant of the danger she was putting herself in, and me by extension. “That’s an ugly thing to say,” she remarked with a bite in her mild voice. She turned away from me to look at a false window with a holographic projection of a garden. Her dark wavy hair fell across her cheek. “The longer we spend on this ship, the less time we have to find a cure,” I said. Mariella didn’t look at me. She didn’t speak. I stood for a moment, and let the familiar feeling of helplessness wash over me. I rejected it, shoving it deep down inside me. If she wanted to act like a child, fine. I had other things to do anyway. I left the room without saying another word. Earlier that morning, I’d been told that the captain of the Vengeance, General Rouhr, wanted to meet with me. I couldn’t imagine why. I didn’t think he knew who I was. I certainly didn’t know who he was. I’d kept my contact with the aliens at a minimum since I arrived on this ship, unlike Mariella and the other woman, Jeneva. Mariella preferred to spend her time looking at imaginary gardens and talking to Tu’ver. Jeneva was actually with one of the red ones now. If they wanted to risk their lives like that, who was I to stop them? Sure as hell didn’t mean I trusted any of them. I strode through the sliding metal doors of one of the com rooms. General Rouhr, a rugged-looking Skotan with a scar running down the left side of his face, greeted me with a nod. My gaze flickered to the others in the room. I was surprised to see Jeneva there. She smiled at me. I didn’t smile back. When I first met her, she was prickly and unfriendly. I didn’t fully understand what changed about her. The Skotan she’d become enamored with sat next to her. I believed his name was Vrehx. He was the only one on the ship I didn’t mind, and he had the good sense not to bother me. My gaze settled on the hulking form of a green Valorni. Jagged purple bands stretched over his broad shoulders and along his thick arms. This creature was a living, breathing personification of a migraine. Axtin was brash, thickheaded, and impulsive—everything I hated. What the hell could he possibly be doing here? “Ms. Dewitt, thank you for coming,” General Rouhr said. It was strange hearing him speak in my language. The ear transmitter, one of the things they’d given us when we’d first arrived, had somehow taught the aliens our language. Once I learned I could understand them without the transmitter, I insisted they removed it. I didn’t like the idea of alien tech crawling around in my brain—and it literally did crawl. I’d never forget the horrible way it felt when it was first inserted into my ear canal. Mariella and Jeneva had elected to leave theirs in. Because of this, they knew considerably more of the alien’s tongue than I did. I’d also made a point to avoid as much contact as possible, so there’s that. “Will this take long?” I asked tightly. “Why? You’ve got somewhere else to be?” Axtin smirked. I didn’t even dignify his response with a glare. I remembered. It was a devastating attack. Duvest was the manufacturing capital of the planet, and many labs relied on the equipment produced there. “Why?” I demanded. I hadn’t told anyone about my work or my research. I clenched my jaw and squeezed my hands into fists, shoving my temper down. “Mariella mentioned you studied chemistry,” Vrehx offered. I cursed, low enough that only myself could hear it. Mariella had no right to talk about my life to them. But despite my anger, the idea of working again sent a jolt of excitement down my spine. I missed being in a lab. I felt more at home there than anywhere else. Regardless of my distrust of the aliens around me, I did want this war to end. I wanted the Xathi gone. “Do you have more information?” I asked General Rouhr. He slid a thin data pad across the table to me. Displayed on the screen was a detailed plan for the bomb and several potential chemical formulas. I could already see a few places where the formulas could be improved. I wondered what their lab setup was like. The city was hit pretty hard. I doubted they had as much as they needed. What supplies were available to them? Who was working on this? How did they know for sure that the Xathi are sensitive to smells? “I can see the crazy wheels turning in her head,” Axtin muttered. I resisted the urge to throw the data pad at him. He was right anyway. My mind was whirling, and it felt amazing. If the people in Duvest were able to send these notes, then they had network access. There was a chance, albeit a small one, that I could recover my own research notes from their lab. And if their lab was as good as I hoped it was, I could remain in Duvest to work on finding a cure. “I’d be happy to help.” I smiled at General Rouhr. He blinked once, the only indication that he was surprised by my quick response. Jeneva pulled out a map of the region and laid it flat on the table. “I took the liberty of marking out the quickest and safest way to get there,” she explained. She swiped a hand over the map, and a three-dimensional holograph grid rose up between us. A glowing blue line snaked across the map, marking my theoretical path. “This way avoids any known animal breeding grounds, environmental instabilities, and other hazards,” Jeneva continued. Though I didn’t know much about her, I knew she lived in the wilds of the forest alone for an impossibly long time. I had enough good sense to take her word for it when it came to matters of survival. “That doesn’t look too bad,” I ventured. Duvest wasn’t as far away as I thought it was. If I stuck with Jeneva’s path, I’d be fine. Besides, I wasn’t completely helpless out in the forest. I’d managed to track down Mariella in the dingy backwater she’d been living in. Before I could stop myself, I imagined what it might have been like if I hadn’t decided to find her. Would the aliens have found her? Would she even be alive now? Would I even be alive now? I forced my mind to go quiet. Making room for those thoughts wouldn’t do me any favors. Mariella was alive. I was alive. That’s all that mattered. “I think it’ll take the two of you a little more than a day to get to Duvest,” Jeneva went on, completely unaware of how quickly my heart was beating. “Two?” I asked, almost missing what Jeneva said. “You didn’t think we were going to send you out there alone, did you?” Vrehx chimed in, his brow furrowed in what might have been a true concern…or maybe he just thought I was stupid. It was hard to tell with him. “She wouldn’t last an hour out there alone,” Axtin scoffed, folding his arms across his broad chest. I wasn’t keen on making that trek alone, but now I wanted to show that arrogant prick I could. “What?” Axtin and I blurted at the same time. “He’ll get us killed before the Vengeance is even out of sight!” I exclaimed. That moron sought out a fight whenever he got the chance. He’d lead me right into a den of some awful, poison-spitting monster for the fun of it. 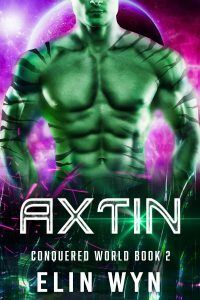 Axtin is live and in Kindle Unlimited now! Click here to keep reading! Excellent and I didn’t see any typos. I like strong female characters. Got my attention. Looking forward to reading Axtin. Keep them coming.